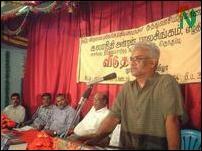 Mr. T. Gnanavel, the head of the political wing of the LTTE in Vavuniya presided over the function. 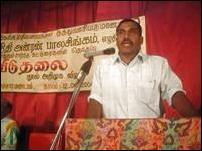 Mr. T. Tharmendran, the political head in Vavuniya town, raised the Tamil Eelam national flag. Mr. Subramaniam, a father of two martyrs and two fighters, lit the flame of sacrifice. Ms. Alai, the women’s political head of the LTTE in Vavuniya, delivered the welcome address. Mr. Puthuvai Ratnathurai, a poet who heads the LTTE’s arts and cultural affairs department, made the introductory speech. Mr. Vino Noharathalingam, a Tamil National Alliance MP for the Vanni district, presented the first copy to the chief priest of the Kudiyiruppu Pillaiyar temple, K. Kandasamy Iyer. Mr. Puthuvai Ratnathurai giving the introductory speech. 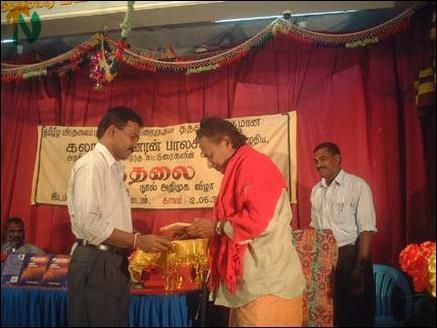 Mr. Sivanathan Kishore, another TNA MP from the Vanni district, presented guest copies. Mr. S. Nandakumar, the dean of the faculty of commerce at the University of Jaffna-Vavuniya campus and Mr. S. Jeyachandran, the manager of the Vavuniya North teachers’ training college, reviewed the book. Mr. S.N.G. Nathan, the secretary of the Movement for National Awakening, delivered the vote of thanks. Mr. Vino Noharathalingam, MP, handing over the first copy of 'Viduthalai' to Chief Priest Kandasamy Iyer.